No, it’s not chocolate cake master planning, learning from snowstorms, or one of a number of critiques on the profession of architecture. 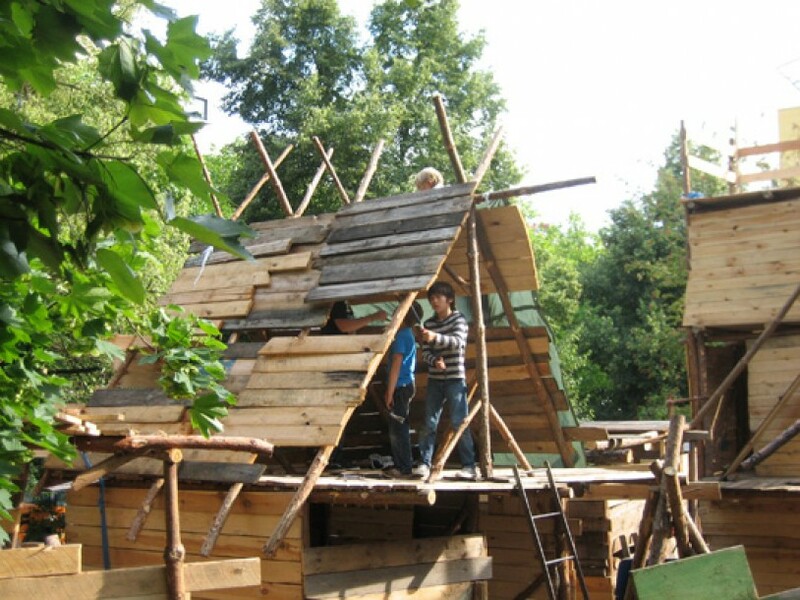 ……..about children, ages six through sixteen, building a playground in Berlin of two, three, and four story towers. To be frank, the towers are amazing and one could easily fall in love with them alone. However, it is not only the shear beauty of the towers but the incredible safety record of the playground and the fact that the kids build them each year (the playground is deconstructed in the fall and redesigned each spring) with minimal adult supervision that has truly captured people’s attention. In short, the Kolle 37 bauspielplatz, despite a growing interest in play, is like nothing a majority of people in the United States have ever seen or think is remotely possible. It completely redefines people’s perceptions of play, playgrounds, risk, and the abilities of youth. You can’t blame Americans for their shock when they are surrounded by a landscape of red-blue-yellow play structures; their children are overwhelmed by high stakes testing; laboring under insane attitudes towards risk that expects so little of our youth; and depending on what you consider ‘adventure’, there are only one to three adventure playgrounds in the United States. No matter how you slice it, there is nothing like Kolle 37 in the United States. We are working hard to change this and couldn’t be more excited to announce that this October, in partnership with the Pennsylvania Horticultural Society (PHS), we will be design-building a temporary adventure play space with Philadelphia youth in PHS’s Pop-Up Garden. Sure, we are pretty lucky and get to see the amazing things that youth are capable of designing and building on a daily basis but design-building a play space with youth next to the most famous and visible park in the Philadelphia–Rittenhouse Square–is simply unprecedented. Wow, what an incredible stage for redefining the role that youth–such as our #TinyWPA #teendesignheroes–play in the designing of our cities and what an amazing place of play, and experimentation for Philadelphia youth! In the spirit of theme of the Horticultural Society’s Pop-Up Garden and to help grow a culture of ‘making and doing’ in Philadelphia, the design-build process will include hands-on building activities, ‘doing’ workshops, and a tinkering space for the general public. To foster a larger conversation about the capabilities of youth, the design of playgrounds, and the state of play in Philadelphia, a series of expert presentations and public forums will occur during the building process. And of course, we couldn’t be more pleased that these conversations and the building will occur in the context of events organized by the Horticultural Society around food and healthy communities. Want to visit or come be a building hero with our #teendesignheroes? Construction will occur from October 1st through the 15th and there will be a public event in conjunction with Design Philadelphia on October 14th from 10 am to 2 pm. You can also send us an email– info@publicworkshop.us if you are interested in receiving updates about various opportunities to participate. And if you haven’t seen Paige’s playground blog–the best in the world–stop what you are doing right now and pay it a visit.